Founded as a small brewpub in downtown Bend, Oregon back in 1988 by Gary Fish, Deschutes has grown into one of the most talked about breweries in the country. Known best for their big beers like The Abyss, Black Butte XXI, and Mirror Mirror, the company also has a very full protfolio of year-round and seasonal brews. 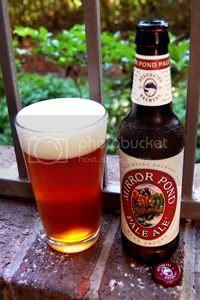 To start off, I decided to go with their most popular beer: Mirror Pond Pale Ale. Described by the brewery as "the definitive American Pale Ale," Mirror Pond goes through four hop additional during the boil and a round of dry-hopping after. They only mention Cascade hops in their marketing, so I'm unsure what (if any) other varieties are used. As for the backbone, Deschutes mention they use Crystal malts to offset the hops for a solidly balanced beer. I love a nicely balanced Cascade-driven Pale Ale, so let's get to it. Appearance: A slightly hazy, pumpkin-colored body. On top, a finger and a half of off-white creamy head featuring excellent retention and lacing. Aroma: Floral and citrusy Cascade hops over a solid caramel malt base. Classic American Pale Ale all the way. Taste: A wave of Cascade hops in the front, a little more grapefruity then in the nose. Underneath, a sold caramel malt backbone keeps everything well balanced. Sure, I'd love to see more focus on the hops, but I suppose that's what IPAs are for. The aftertaste retains the balance, with equal doses of bitterness and sweet malt. Mouthfeel: Medium-bodied with moderate carbonation. It gets a little watery in the finish, limiting the aftertaste's strength a bit. Drinkability: This is an easy drinking beer, just what you want from a Pale Ale. Verdict: Mirror Pond is a great example of the American Pale Ale style. While not the most complex beer out there, this does make for a very solid session beer. I can't wait to see what these guys are cooking as far as IPAs and Double IPAs go.